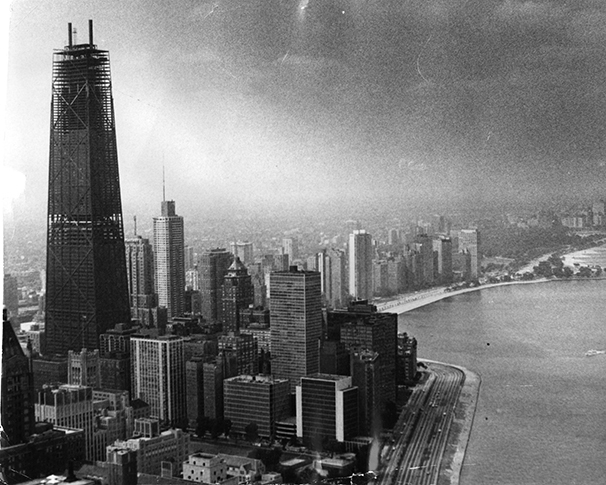 Fifty years ago this month, construction of the John Hancock Center topped out. It was a dramatic moment in a still-unmatched development cycle in Chicago, where three skyscrapers over 1,000 feet tall — including the world’s tallest, Sears Tower — were completed in a five-year period ending in 1974. That era in Chicago stirred imaginations, boosted civic pride and spawned architecture and engineering techniques that helped fuel a worldwide race to the sky. Today several developers are once again aiming for the clouds in Chicago. Years into an already lengthy commercial real estate cycle, one 1,000-foot-plus skyscraper is under construction and another three are in advanced planning. History has shown there’s no guarantee they’ll all get there. If successful, this construction boom could generate billions of dollars in investment and tax revenues, waves of construction jobs and new centerpieces on Chicago postcards. Or this go-around could be a repeat of the last cycle, when big dreams brought Chicago’s second-tallest building — Trump International Hotel & Tower — but also two lasting eyesores after the world economy collapsed. The 76-foot-deep foundation hole where the 2,000-foot Chicago Spire was planned, and the 27-story skeleton on Wacker Drive, where construction of the planned 1,050-foot Waterview Tower halted, demonstrated that the most ambitious buildings also are the riskiest. To build a supertall skyscraper is to flirt not only with immortality, but also with financial ruin. “Architects and city planners know that beautiful tall buildings will live on in the skyline long after the developers and owners go broke,” said Chicago developer J. Paul Beitler, who in the early 1990s attempted to build a 1,999-foot building called the Miglin-Beitler Skyneedle in the Loop. The 100-story Hancock was completed in 1969, and the next year work was underway on the Sears Tower and the Standard Oil Building, now known as the Willis Tower and the Aon Center, respectively. The Hancock, or “Big John” (now officially known by its address of 875 N. Michigan Ave.), began with failure. In 1966, improperly poured concrete in structural caissons caused the partially built tower to tilt, halting construction for six months until the issue could be inspected and repaired. The setback caused developer Jerry Wolman to go bankrupt and lose ownership of the Philadelphia Eagles football team. The snafu also, for a time, diminished the prestige of the highly anticipated skyscraper. “At a society ball where participants were to come dressed as history’s biggest boo-boos, a few appeared in tipsy boxes representing the John Hancock Center,” according to a Chicago Tribune Magazine story in 1985. The John Hancock Mutual Life Insurance Co., which was financing the tower but hadn’t intended to own it, stepped in to rescue its namesake structure. Despite the early setback, the 1,128-foot Hancock and 1,451-foot Sears/Willis are two of Chicago’s most beloved buildings. Their lasting legacy was the innovative bundled tube structural systems created by structural engineer Fazlur Khan and architect Bruce Graham of Skidmore, Owings & Merrill. The concept, reinforced by X-braces at the Hancock, reduced the need for interior columns and created open floors. 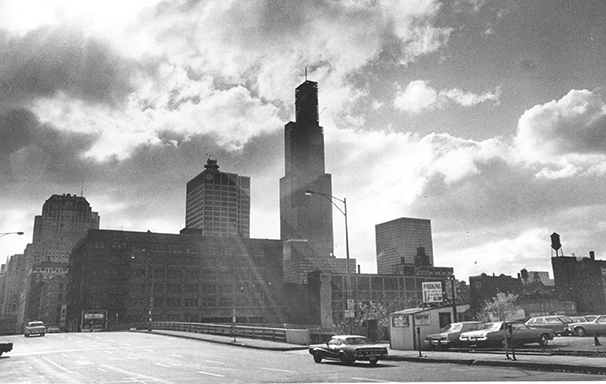 The 110-story Sears Tower also gave Chicago, the birthplace of the skyscraper, the world’s tallest one for 24 years. “Having the world’s tallest building matters,” said John Zukowsky, former architecture curator at the Art Institute of Chicago. “It shows you’ve arrived. You’re the city. Sears Tower’s title of world’s tallest lasted longer than the namesake retailer’s headquarters, which had moved to Hoffman Estates almost a decade earlier. Even so, most of the world’s tallest towers are now being constructed in Asia and the Middle East, often backed by governments such as China’s. There, a skyscraper may function as the centerpiece of a new district, said former SOM architect Adrian Smith, now of Adrian Smith+Gordon Gill Architecture. Smith’s designs include Chicago’s Trump Tower and the world’s tallest building, Dubai’s 2,717-foot Burj Khalifa. He also designed Jeddah Tower, the partially built Saudi Arabia building that is planned for a record 3,281 feet. Four buildings above 1,000 feet have been proposed in Chicago and unlike the last boom time, when developers were financing some projects almost entirely with debt, there are no clear-cut signs of a looming crash. There’s also little evidence that a wave of big projects is, in and of itself, proof of a coming collapse, Safarik said. 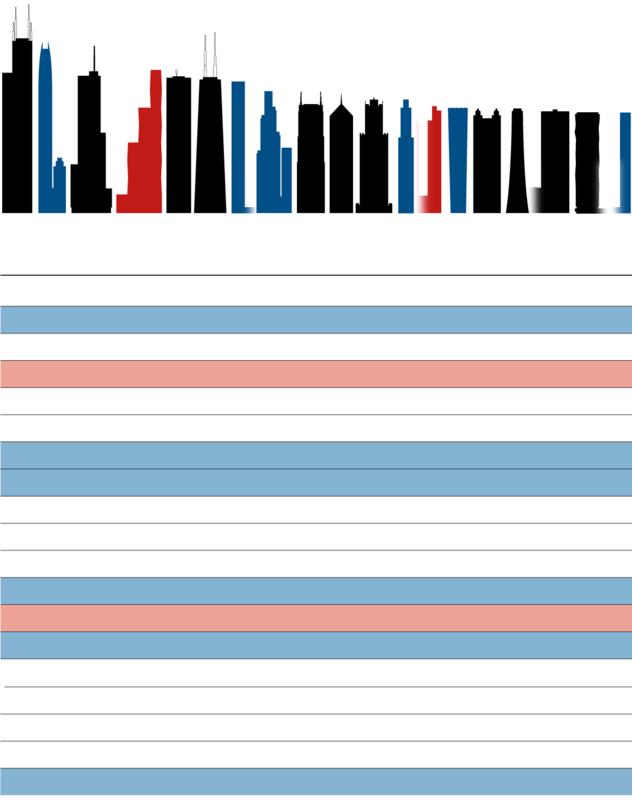 For now, at least, bank debt and capital are flowing. 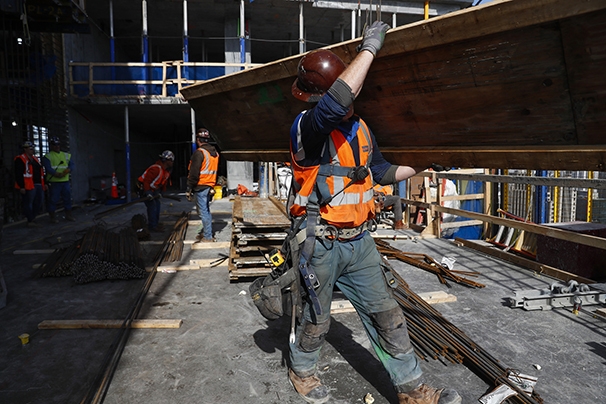 Chicago’s ramp-up in soaring projects is part of an international trend. Worldwide, there are 130 buildings that the Chicago-based Council on Tall Buildings and Urban Habitat considers supertall, which is over 300 meters (984 feet) tall. But there are another 159 under construction or topped out, and 186 more proposed. 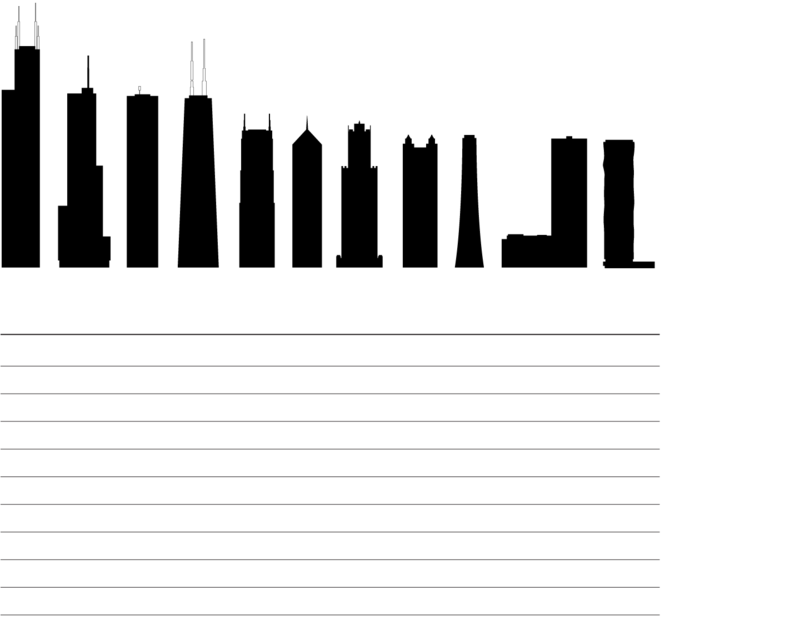 There are 19 supertall buildings in the United States, including six in Chicago. Nationally, there are another 13 under construction and 26 more proposed. The only supertall tower currently under construction in Chicago is Vista Tower, the 1,191-foot condominium and hotel tower along East Wacker Drive and the Chicago River. The Jeanne Gang-designed tower, taller than all but Willis and Trump, has risen to about half its eventual height. It is expected to open in 2020 in Magellan Development Group’s sprawling Lakeshore East mixed-use development. Magellan and Chinese investment partner Dalian Wanda Group have continued construction even amid speculation that Wanda will be forced to sell its interest in the $1 billion project because of a crackdown by the Chinese government on investments outside its country. Meanwhile, across the river, Los Angeles-based CIM Group and local development partner Golub & Co. propose a 1,422-foot hotel, condo and apartment tower next to Tribune Tower. The skinny new tower, designed by Gordon Gill, would be built after Tribune Tower’s conversion into condos and new retail space. 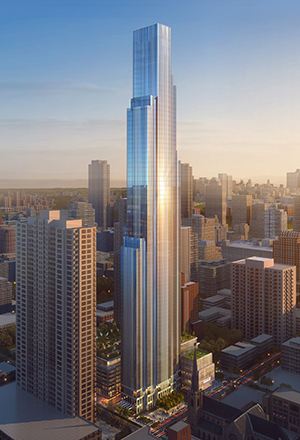 If it gains zoning approval and is built, it would become the city’s second-tallest skyscraper. The newspaper is set to move in June to Prudential Plaza. 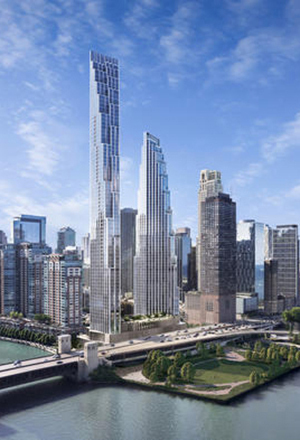 Along the river, on the site of the failed Chicago Spire, Related Midwest plans a pair of towers, including one of 1,100 feet. The two-tower plan, by David Childs of Skidmore, Owings & Merrill’s New York office, would create condos, apartments and a luxury hotel on the 2.2-acre site near Navy Pier. 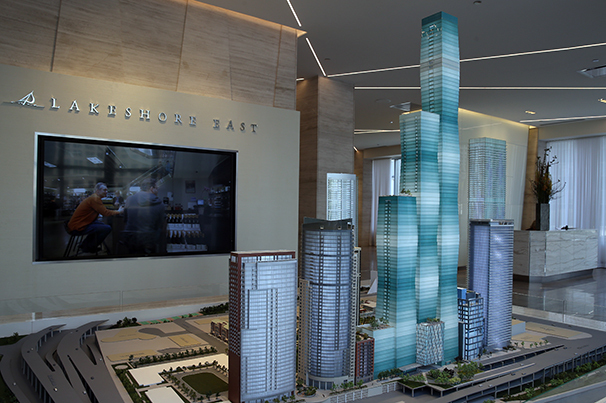 The development is now called 400 Lake Shore Drive. Across from Holy Name Cathedral, JDL Development plans a pair of luxury residential towers over a large retail base. 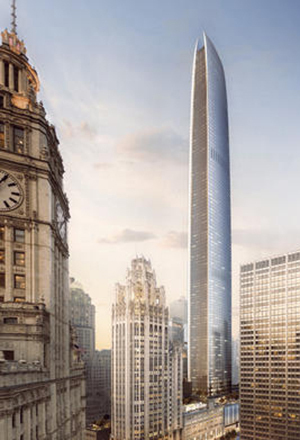 One Chicago Square’s higher tower would rise 1,011 feet. Architect Frank Lloyd Wright’s proposed mile-high building. Proposed skyscrapers, of course, do not equal skyscrapers. In 1956, Frank Lloyd Wright unveiled plans for the Mile-High Illinois, a 528-story office building that, as its name implies, would stretch more than a mile into the sky. At the 2,000-foot level, the Spire and two proposed office buildings, the Skyneedle and 7 South Dearborn, came closer to fruition than Wright’s dreamy vision. But time is money, said Smith, who designed the Dearborn building. Trump Tower bridged the gap by completing parking and a hotel on lower levels first, and creating cash flow sooner, Smith said. When Lee Miglin and Beitler unveiled plans for their Skyneedle in 1989, at Madison and Wells streets, the longtime development partners already had plans for its top and bottom. They planned to build up to as high as 1,999 feet, because everything above 2,000 feet is considered federal airspace and requires government approval, Beitler said. Beitler and Miglin believed an observation deck atop the tower would be a cash cow that, combined with parking on lower floors, could provide enough revenue to justify building the structure even without any office leases signed. “We were very close to financing it before the Gulf War (starting in 1990) brought the capital markets to a standstill,” Beitler said. Miglin and Beitler maintained hopes of reviving the Cesar Pelli-designed project in the years that followed, but Miglin’s murder in 1997 ended the plans. 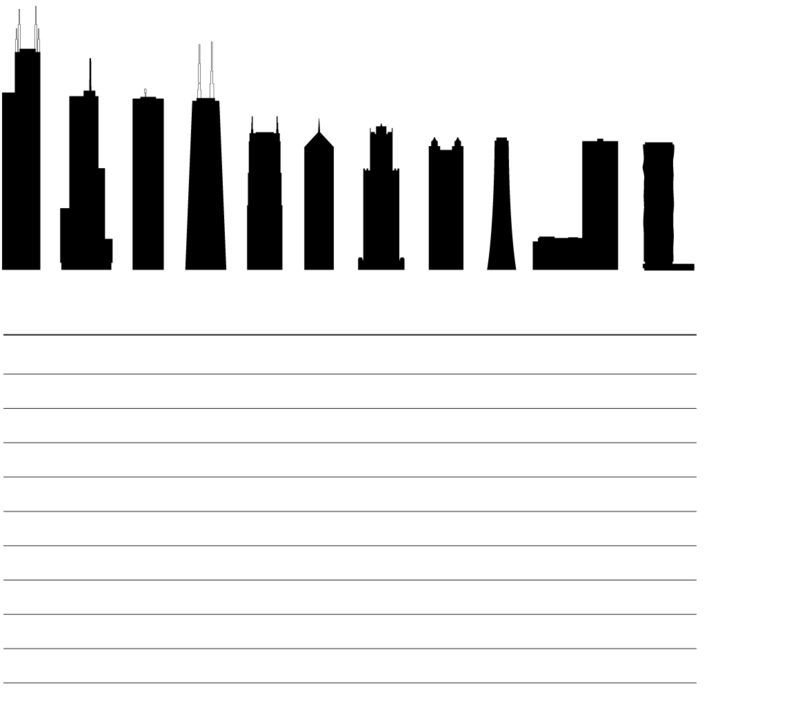 Given Chicago’s history, it’s fair to wonder whether the city will ever see a megatall skyscraper, defined as 600 meters (1,968 feet) or more. Smith believes it’s possible, although likely not in his lifetime. It probably could only happen if Chicago officials craved something spectacular to promote the city and contributed significant public dollars to help finance it, Smith said. “You’d have to build it for tourist reasons, and there has to be something unique at the top,” Smith said. 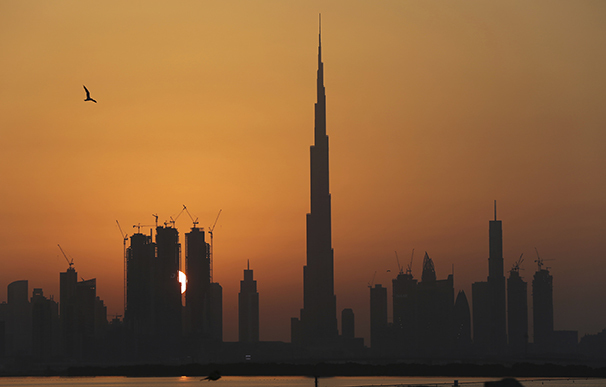 Dubai’s Burj Khalifa is connected to a massive shopping mall, which tourists must pass through to access the tower’s observatories, which themselves churn out $120 million in annual revenue, Smith said. 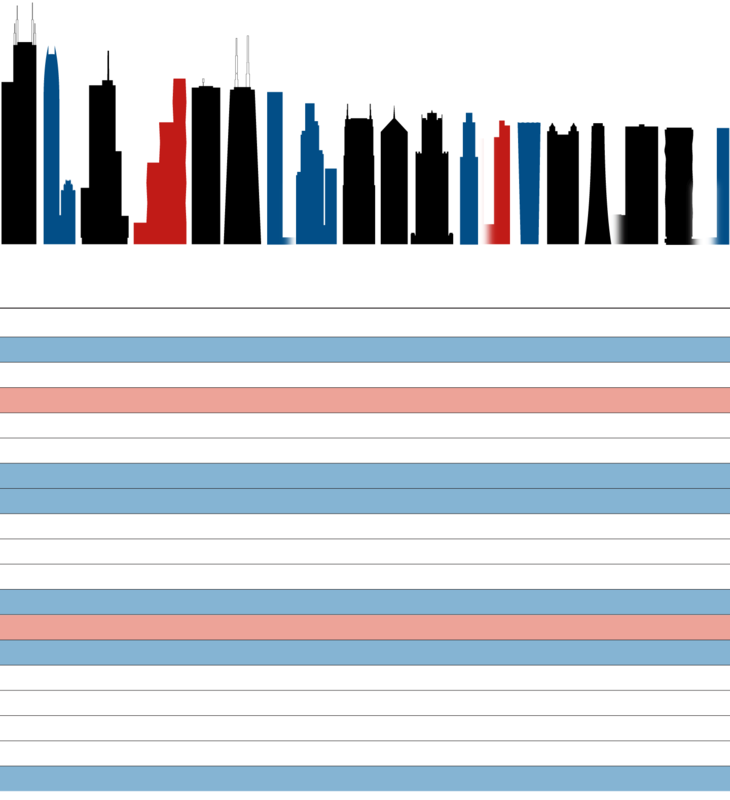 The other question is, does Chicago want it? The 400 Lake Shore Drive architect, who also designed One World Trade Center, worries that extreme heights create a sense of detachment from the very city a skyscraper is meant to enhance.